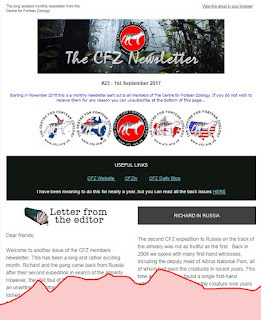 NEWSLINK: Teen tells judge he bought tiger cub on ..
For those of you not in the know, at the beginning of each month we send out a newsletter to all members of the CFZ. The most recent (which went out this morning) included articles on the expedition to Russia, Paul Vella, a chupacabra skull that isn't, a picture query from Col Blashford-Snell's Mokele Mbembe expedition, o.o.p Nile Monitor, a mysterious animal that might be a 19th Century blue dog, a mystery cat from Nepal, a new book on vampires, CFZ not in the news, the return of OTT, Expedition Profiles for 2017, Notes and Queries etc. I am feeling surprisingly cheerful today. And for no particular reason. I have just heard from Judge Smith who has decided -it seems - to return to live performance with a new band. On top of this Spirits Burning made a rare UK live performance recently and I shall be talking to both Judge and Don Falcone very soon and the results will be in the magazine, as you might expect. By the way, forgive me for banging on about this but on a personal level I would be very grateful if you could spread the word about our rebooted monthly webTV series after a break of nearly four years. I actually hadn't realised it had been so long, but - then again - my concepts of time and space are fairly abstract at the best of times. ON THIS DAY IN - 1939 - World War II began when Germany invaded Poland.